Week 4 of Strictly is upon us and the standard is higher than ever. Eviction wise there are 2 main favourites. Jodie and Jessie are rightly favoured but I feel Jodie will do enough this week. Jessie was up first last time so shouldn't be this time but I still reckon that as the worst dancer left, she will go. She is just the wrong shape and as leaden-footed as they come. Plus rumours from the show suggest she isn't liked much. The Elephant will go. Expect strong performances from Rachel and Cherie which may lower their overall odds. Cherie in particular looked very good on It Takes Two, using her acting skills(sic) to nail a hard dance. 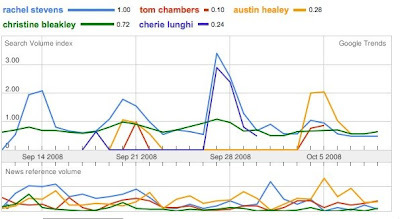 I have included a screenshot of what I think is a very valuable tool in specials betting - Google Trends. Everyone knows about using Youtube and internet polls but this is another useful arrow in the quiver. It picked out George Sampson in Britain's got Talent as winner so I like it a lot. Keep an eye out once the sexes merge in the show in a few weeks. The thing that stands out is that apart from the general noise of frisky teenagers searching for her, Christine Bleakley hasn't stood out yet - is she underpriced? We shall see.